Everyone has it. 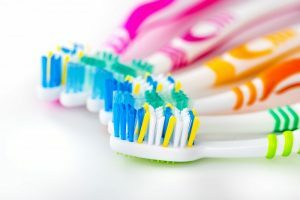 Whether it’s a drawer, a closet, a shoebox, or a shoebox in a drawer inside a closet, we have a large collection of unused toothbrushes, dental floss, toothpaste, and perhaps even mouthwash. Sometimes we buy in bulk and forget that we have it, or we’ve just been visiting our dentist in Waco every six months like we should be. Regardless of how the pile started, you might be wondering how much of it is still usable. You hate wasting as much as the next person, but don’t want to put yourself at risk either. Today, your dentist is prepared to settle your questions for good. According to your dentist, old toothpaste is fine to use past its manufacturer date. The FDA technically doesn’t require products to even have an expiration date, so the manufacturer uses their best judgement to determine a date. However, just because it’s safe to use doesn’t mean it should be your first choice. If you find yourself in a bind, then go right ahead (it’s better than not brushing at all.) Toothpaste that is two years past its “expiration” date will have reduced flavor and fluoride effectiveness. To make sure you get the best cleaning possible, use it before this occurs. Try to stash them in your to-go bag when traveling. Dental floss never truly expires, so don’t use it as an excuse to skip flossing! However, if you enjoy using flavored toothpaste, use it within a year of purchasing. Once a year has passed, the flavor will have significantly faded, making its use less enjoyable. Toothbrushes Have to Be Good, Right? Yes, of course they are. They’re especially good if they haven’t been taken out of their packaging. This protects it from dust and debris typically found in the dark depths of your closet. Keep in mind that when used regularly, it will become less effective. The bristles will become frayed, therefore making it worse at cleaning your teeth. Try to replace it every 3 months and throw your extras into your to-go bag. Make sure all your family members have spare toothbrushes as well. Can I Use This Unopened Mouthwash? Mouthwash is a little trickier. Most mouthwashes use antiseptics to remove bacteria, like alcohol. While this is the active ingredient, mouthwash is mostly just water. Once it’s been 2 to 3 years past its manufacturer date, the alcohol will begin to dissolve. Your dentist in Waco hates wasting dental supplies. Schedule an appointment with him today to get more after your bi-annual examination and cleaning! Dr. Rick Cofer grew up in Irving, Texas before attending McMurray University. After earning his biology degree there, he attended Baylor School of Dentistry to earn his dental degree. After opening his first practice, he eventually moved to another location to form Premier Family Dental in Waco which opened in 2012. To learn more advice on using dental products or learn about the practice, contact him at (254) 732-0309 or visit his website. by: Dr. Rick Cofer at March 14, 2018 .